I had meant this to be my 200th post, but something went a bit awry and this is actually my 201st. Anyway, 200-odd posts seems a suitable point at which to take stock of where things stand on this blog and highlight a couple of important developments. 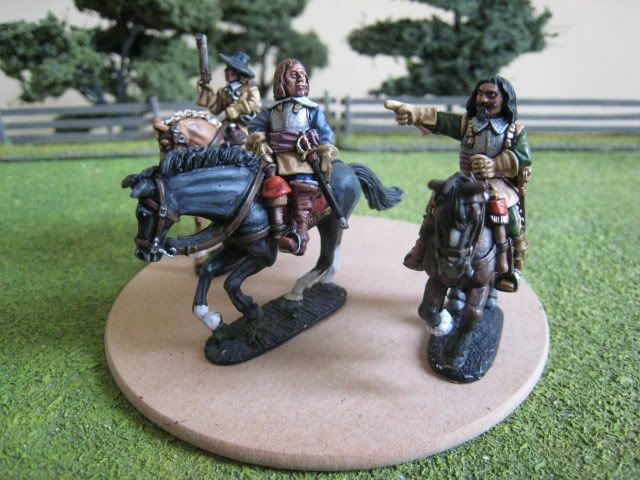 Readers will have noticed the lack of newly painted AWI figures on this forum, and many will know that this is because over the past few weeks I have been hard at work on two new periods - the First Carlist War and the English Civil War. Both are periods that I have been drawn to for a while. Whereas in the past I have found it very difficult to leave the AWI for other periods, the occasional foray excepted, this time I have found it very difficult to return to the AWI after settling in to something different. I have almost 80 FCW figures painted up now and my first ECW regiment is also nearly finished, together with a couple of guns and some personalities. I suppose what I'm saying is that I'm currently enjoying a leave of absence from the AWI. A second issue of importance is that, all going well, in December I will become a father. That will obviously have a huge impact on my painting output and it made me realise that I want to squeeze in a couple of small collections for new periods prior to the shutters coming down on or around 3 December. So that is another factor in a drift away from the AWI. A third factor is that, after 5 years of almost total concentration on the one period, I am simply running out of things to paint for the AWI. I could continue to paint every British and Hessian regiment that appeared, but given the impending chimes of midnight that doesn't really seem a good use of my time. I worked out the other week that there are really only a dozen more AWI units I would want to do, and I would rather paint them at leisure over the next couple years, as and when I have a need for them, than rush them all through this year. So where does that leave this blog? In a way, that's largely the reason behind this post because I would like to know what readers would rather see: a halt to this blog and a new one started on my new periods, or a continuation of this blog but with far less AWI content and far more other stuff. I can see merit in both approaches. 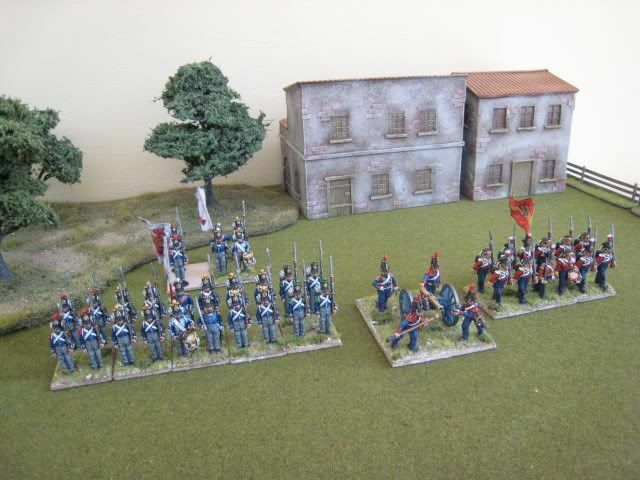 For example, the attraction of having a blog solely on the First Carlist War (to show what a colourful and interesting period it is) is balanced by a concern that many people won't bother looking at it. Then again, it's easier to manage everything in one place. It did occur to me that all 3 periods are civil wars, and I thought perhaps I could tweak the title of the blog to reflect that. There will be more AWI posts, just not nearly as frequently as before (perhaps once a month). So if you have a view either way, please let me know; and if you want to see the new stuff I have about 6 posts' worth already! 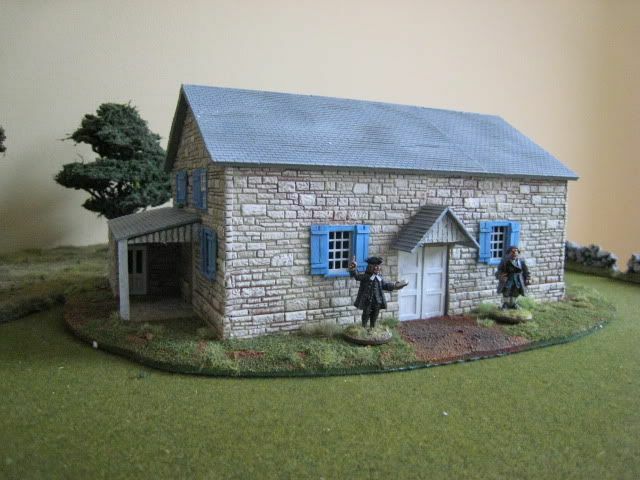 This is a model of Old Kennett Meeting House, which is one of the surviving buildings on the Brandywine battlefield in Pennsylvania. Kennett Township, in Chester County, was formed on part of the land granted by King James II to William Penn in 1682. It seems to have been inhabited by Lenape Indians and a small Swedish community was already in residence when the English arrived. The name "Kennett" seems to have been taken from one of the first settlers' home village, Kennett in Wiltshire. The area had a large Quaker community (including Penn himself) and it was these people who built this meeting house. The Quakers had previously crossed the Brandywine to attend meetings at Brandywine Hundred, but due to the creek's inaccessibility at certain times of year the Quakers built their own house in Kennett. The original building of 1710 was enlarged twice, in 1719 and 1731. Meetings still take place there during the summer. Penn's guarantee of freedom of religion ensured that many Quakers across Europe emigrated to Pennsylvania to escape persecution at home. The House was on the western side of Brandywine Creek, near Chadd's Ford. It formed part of Brigadier General Maxwell's initial line of defence against Knyphausen's attack. The British and Hessian troops were camped around Kennett Square, closely watched by a detachment of light infantry who had decided that a nearby tavern offered the best vantage point. Shortly after 9am on 11 September 1777, these troops saw Queen's Rangers and Ferguson's Riflemen on the move towards them and realised that some sort of attack was imminent. 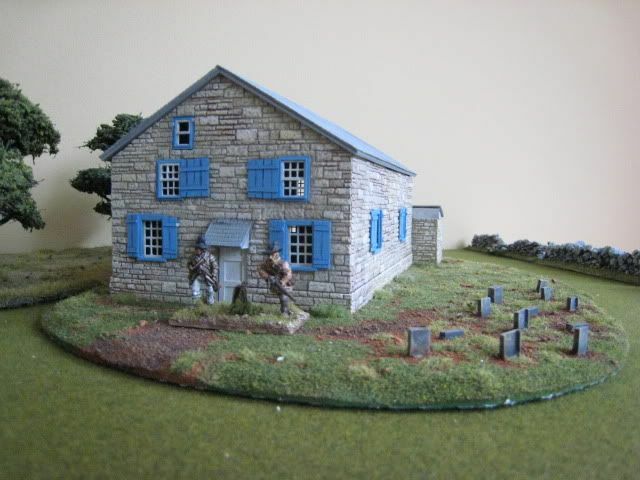 After firing off a few shots the light infantry fell back and took up a position behind a stone wall on the western edge of the Old Kennett grounds. As further American troops arrived and the British deployed into line, a firefight started. Apparently the Quakers were having a meeting at the time; worshipper Jacob Peirce recorded that "while there was much noise and confusion without, all was quiet and peaceful within." 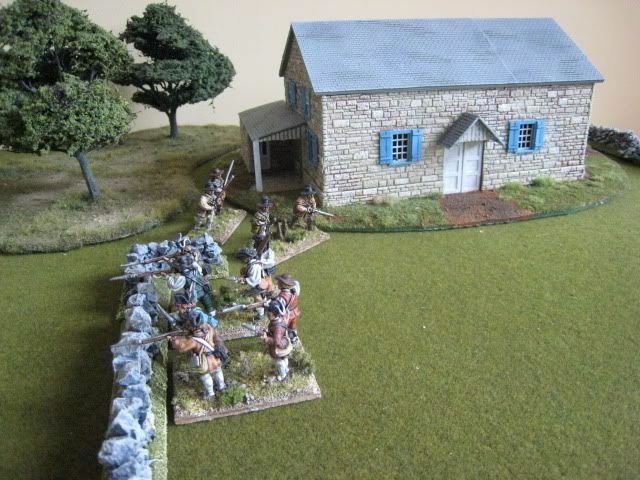 Maxwell's troops skirmished with the British before eventually falling back across Chadd's Ford. 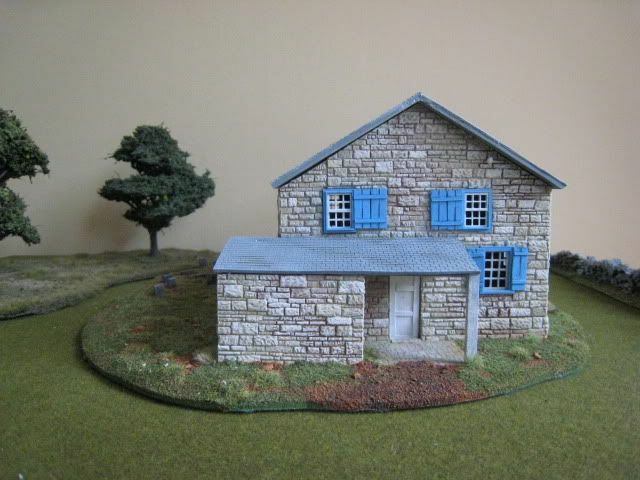 The model was made by Paul McDonagh of Paul's Modelling Workshop . I saw Paul's ad in Wargames Illustrated, was impressed by the work on his website, and got in touch. I was lucky to find a whole load of photos of the House (see here for what the original looks like) on a very useful website, the Historic American Buildings Survey. The cost of the model was £65 plus £8 p&p, which I think is pretty reasonable, and the lead time a rather impressive 2 months. 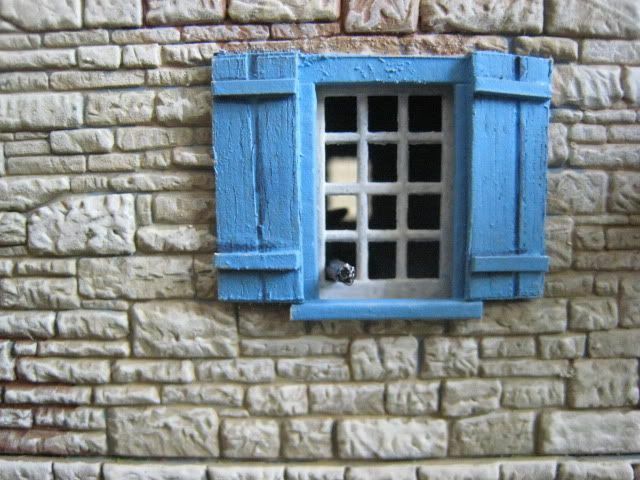 The roof of the model lifts off and the windows are hollow, as you can see from the pic below. 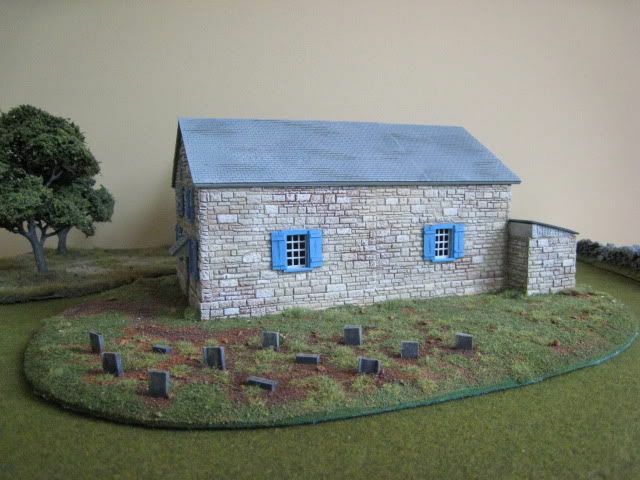 As Paul bases all his models I asked him to add the small graveyard which is to the east of the House. Although none of the gravestones currently on site date from before the early 19th century, records show that the graveyard was in use during the 18th century. Some of the casualties of the Brandywine battle were apparently buried here. Paul's modelled the graves very well: in keeping with their traditions of simplicity, Quaker gravestones are unadorned and quite small. As always with old buildings, it's difficult to know exactly what they looked like over 200 years ago. I suggested to Pual that the walls be in natural stone rather than whitewashed, which is how the building looks now. We also left in the small annexe to add some interest, although I suspect that is a later addition. 2 figures. Painted April 2009.